As air pollution engulfed the Salt Lake valley once again in the winter of 2014, students, activists, engineers, global citizens, and residents joined artists from Beijing (and Taiwan) on the University of Utah campus to begin a visual conversation about an issue both cities face—smog. This conversation quickly became an international one that moved from the gallery space in Utah to cities in China, Europe, Japan, and the United States. The project initially garnered attention from locals, who were outraged over lack of affordable public transit, and by the repeated breaches of the Clean Air Act by factories that choose to pay fines to pollute over compliance. However, it quickly spread across the United States and to other countries via civic media networks. The citizens of Salt Lake City who are forced to breathe in more toxins each year1—toxins that are linked to increased rates of asthma,2 autism,3 respiratory illness, cancer, and birth defects—were tired of domesticated forms of activism such as petitions and marches on the capitol, which have led to little progress being made towards policy that reduces pollution in Salt Lake. Art provided a new outlet for expressing themselves and addressing the problem. Across the Pacific, the people of Beijing also face a dire air quality crisis, with PM 2.5 levels (particulate matter that has been linked to respiratory illnesses and cancer) sometimes exceeding measurable levels. As a result, infuriated citizens have demanded change on Chinese social media platforms including Weibo and WeChat. Citizens expressing their outrage over these electronically enhanced social networks spurred the government to implement creative and stringent policies in Beijing, including the prohibition of driving and construction on bad air quality days, the creation of a world-class yet affordable subway system, and heavy government investment in solar and wind power. China’s environmental success is predicated upon a burgeoning civic media environment. As sister cities in smog, Beijing and Salt Lake have much to learn from one another and this project forged pathways of communication between these geographically distant regions by combining art and social media to connect over global environmental issues. Local advocacy groups, middle schools, high schools, religious organizations, and local press who found out about the project via Facebook and Twitter, also contributed. People in Japan picked up the story from the BJ-SLC Connect feed and spread it to their networks, encouraging similar projects in their home country. Environmental activists including, Bill McKibben, tweeted about the importance of projects like Beijing-SLC Connect to those engaged in making important environmental changes via creative processes around the world. The inherent creativity of art combined with the creative capacity of social media platforms was a perfect partnership for encouraging new ways of thinking about and combating air pollution by engaging people. Art served as a powerful tool that opened up conversations beyond facts and figures, shared information across cultures, and helped people to think about the problem of air pollution anew. Since the project was very visual in nature, images of the work travelled from the museum to the gallery to the webpage to the newspaper to podcasts to classrooms quickly, engaging people from ten states across the U.S. and ten countries. People contributed in person and online. One poet unable to visit the gallery space in person, submitted his creative project through the BJ-SLC Connect website so it could be added to the online and physical walls of the project. This case study helps to illustrate that the braiding of activism in the gallery and over social media renders the boundaries constructed by scholars such as Gladwell and Shirky between “real” and “virtual” archaic.4 Social media is not simply an addendum to peoples’ lives, but part of their way of being and interacting in the world. In an era where people sleep, eat, talk, drive, walk, and date using digital devices, it is not possible to separate our lives on and off-line because they are dependent upon one another. Social media has become part of the human assemblage. The space between the public gallery and public screens of Beijing-SLC Connect is a seamless space, where people traverse distances in different ways. The Internet, website, artists, and classes that showed up were all actants in a larger network, in which civic involvement could forge new connections. This form of activism moves beyond the restrictive virtual-versus-real activism binary that only limits our thinking by chaining us to outdated ways of being in the world. The three artists from Beijing—Li Gang, Dai Dandan, and Huang Xu—were joined by Taiwanese artist, Meimei Chang, and American artist/photojournalist, Matthew Niederhauser. Together, the five of them turned the Gittins Gallery into a Living Gallery. For three weeks, the artists worked in the space and invited visitors to join them. Using input from locals about their experiences and research they conducted about Salt Lake, they each created works that spoke specifically to community issues. The vibrant online conversation that blossomed concurrently both informed and inspired the art, artists, and visitors to the space who all contributed to the show. The artwork was as wild as the networks it traversed, and ranged from outrageous and creative solutions to the poor air quality to sympathetic displays to cultural critiques. Li Gang brought x-rays of his lungs taken in Beijing to Salt Lake. Fearing he had the “Beijing cough,” Li went to the hospital the week before he came to Salt Lake City. 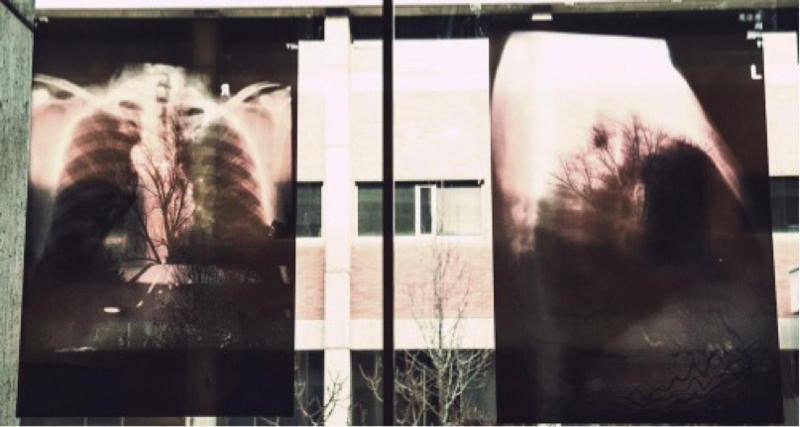 Li combined the x-rays of his Beijing lungs with the natural landscape of Salt Lake, thus creating a hybridization of his body—which has lived its life in Beijing, with a U.S. city—that caused the viewers to pause. With recent studies finding that the air pollution from China’s manufacturing processes is now reaching the United States, this piece re-thinks the relationship between the two countries. Dai Dandan altered perspectives by weaving together images of the Salt Lake Valley covered in a layer of dirty haze. The result: a 4’ by 4’ piece that mesmerized and drew viewers into a space where the smog surrounded her/him. Though residents of Salt Lake will often flee to the nearby mountains to get out of the polluted valley, Dai’s piece did not allow for an exit from the smog-saturated city. The viewers are forced to cope with the pollution that envelops them. The artists worked alongside visitors to the space. Tired of lethargic legislators more sympathetic to big companies than residents afflicted with asthma, autism, and respiratory illnesses, people from across the Valley joined the artists to express themselves in a way that became visible and moved beyond words. By creating art for public display, these messages did not get lost amid pages and pages of bills, propositions, and proposals that died in the legislature. One high school teacher and activist used a mask used for filtering out dangerous PM2.5 particles in the air to create her contribution. By piercing the fabric of the mask with screws, nails, and pins, she wanted to let others know what it feels like to be an asthma sufferer on bad quality days. Nature Conservancy volunteers who had found out about the Living Gallery online came in to paint canvases. Activists from near and far shared stories, statistics, and support via Facebook conversations, sharing, following, and tweeting, which then influenced the work created by the artists. A group of students in a sustainable design course came in once to twice a week over the duration of the show to talk with the artists and other visitors. They designed a series of images intended to urge people in the Valley to action by highlighting the damage these toxins do to people. Though the Living Gallery lasted only three weeks, discussions proliferated long after. It is in these inter-actions that the most fertile spaces for conversation were created. As people stopped by in-person and engaged online, Global Citizenship college students met area high school students; art students exchanged ideas with engineers. Simultaneously, people in China were talking with people in Salt Lake, Ohio, Japan, California, and Europe using the social media feeds. Work of the participants completed, the show closed, but the conversation didn’t. It echoed and rippled across radiowaves, the website, social media feeds, and blogs. People continue to engage with the project over social media today. Civic engagement via social media strengthens the networks necessary to demand more sustainable environmental policies and practices. Since our conversations increasingly employ images, social media becomes a convenient platform for sharing visual information and ideas. These visual conversations are of the utmost importance as we move between regional and global fights for a healthier environment because images have the unique ability to transcend language barriers, at least to some degree. In the case of the Beijing-SLC Connect project, art—a form typically reserved for small elite spaces—became a new medium that connected people who speak Chinese, English, Japanese, Spanish, and French towards a common cause: raising awareness and action to reduce air pollution across the globe. Discussion of "Connecting Across Oceans Over Air"
Version 43 id 316741 of this page, updated 10 March 2015 by Lexie Oberwetter. Created by Roma Dash.